For those who have ever dreamed of adding a near ceiling height display of gorgeous acrylic and metal design — you know who you are — the 8-Foot Evolution Base is here. 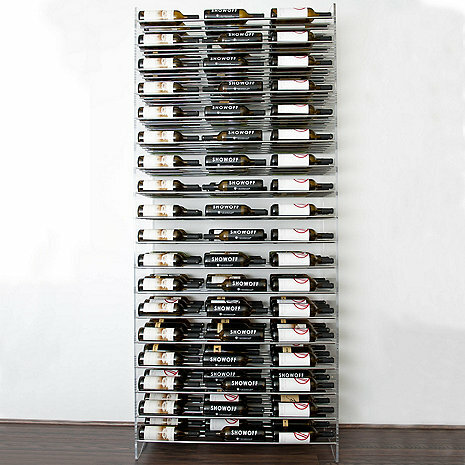 This minimalist and freestanding wine display holds an astounding 162 bottles of wine, bookended by clear sides that allow both natural and LED light to pass through. This standalone piece will catch the eye in any residential room, restaurant space or retail environment. Evolution Series racks are suitable as stand-alone solutions, and fit together in any number of configurations thanks to the modular nature of the design. This Vintage View Evolution rack offers the best display of my wine collection I have ever seen..unlike any others it is gorgeous.